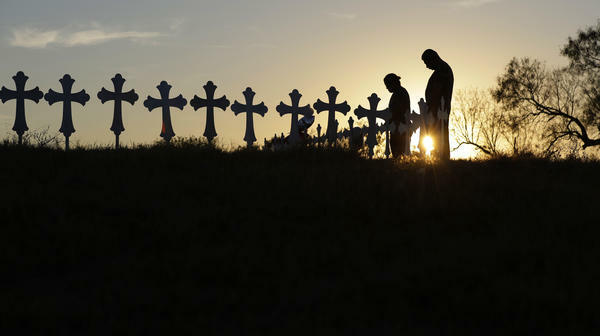 Kenneth and Irene Hernandez pay their respects as they visit a makeshift memorial with crosses placed near the scene of a shooting at the First Baptist Church of Sutherland Springs, Texas. A man opened fire inside the church in the small South Texas community in November, killing and wounding many. 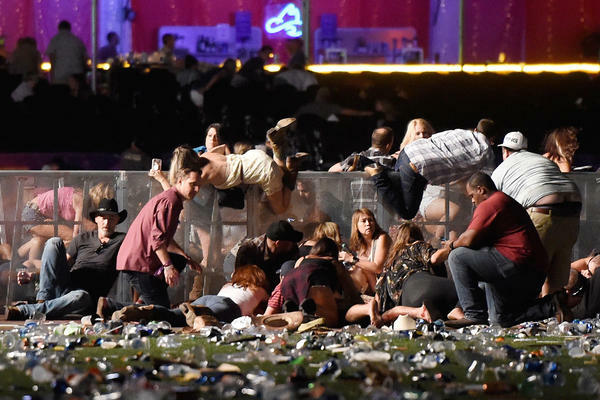 People scramble for shelter at the Route 91 Harvest country music festival in Las Vegas after gunfire was heard. October saw the deadliest mass shooting by an individual in modern U.S. history. A gunman holed up in a suite at the Mandalay Bay casino hotel in Las Vegas and rained gunfire on a country music concert across from the hotel. The attack left 58 people dead and more than 500 others injured. It's still a mystery to investigators what sparked the gunman's carefully planned assault. Many of those who survived the gunfire are struggling with the aftermath. "What bothers me more than the motive, or lack of motive, is lack of information," survivor Melissa Barham recently told Weekend Edition. "Whenever we get a little tidbit of something, we just jump on, because we just have a desire to know." The Las Vegas attack was soon followed by another horrific killing, this time in rural Texas in November; 26 people were killed in a massacre at the First Baptist Church in Sutherland Springs in the middle of Sunday worship. There were also hundreds of less-high-profile mass killings this year across the nation — everywhere from Lawrence, Kan., to a rampage in a small, rural community in northern California, where fast-acting local school staff helped avert a larger death toll. In fact, there were more than 330 mass shootings in all, according to the nonprofit online database Gun Violence Archive. The archive's rather expansive definition of "mass shooting" includes shootings in which four or more people were shot in one location, not necessarily killed. Under that broad definition the real number is likely higher, as some shootings go unreported. The frequency and scale of the killings in 2017 was astonishing even to a nation that at times seems dangerously inured to mass horror and where some Washington politicians offer reflexive tweets or press releases mentioning "thoughts and prayers" for the victims and praise for first responders. "Words and thoughts and prayers simply are not enough. We need action," says Kristin Brown, co-president of the Brady Campaign to Prevent Gun Violence. "Unless and until we get serious about this, we will have more tragedies like these." To the Brady Campaign, getting serious includes passing legislation to expand background checks to fix what Brown calls "gaping holes in the system." For example, these background checks currently don't cover private sales at gun shows or those done over the Internet. Polls show that Americans overwhelmingly support that idea. Another key Senate bill backed by gun control advocates would boost funding, support and enforcement for federal and state agencies to put the right data into the background check system — essentially, to make sure the names of those who shouldn't get guns are, in fact, in the system. Bills to do those two things, however, went nowhere this year in the Republican-controlled Congress. "We are very disappointed that the kinds of policies and procedures and enforcements that we know are essential to really reduce this number [of gun deaths] and can be done are not embraced," Brown says. The Coalition To Stop Gun Violence advocates measures that would prohibit people with "a history of violent misdemeanors, hate crimes and all domestic violence from getting access to guns; ban assault weapons and high-capacity magazines; and enact extreme risk protection orders, which allow family members and/or law enforcement to petition a court to temporarily remove guns from those in crisis." Gun rights advocates argue that new legislation historically has not and will not deter criminals or prevent mass shootings. They point to the constitutionally protected right to bear arms and argue that new gun laws open the door to wider, unconstitutional control. The NRA declined an interview request for this story. The one area where there appeared to be consensus this year was on efforts to curb so-called "bump stocks." The Las Vegas mass shooter, Stephen Paddock, had 23 firearms and a huge amount of ammunition in his hotel suite. He'd converted many of the weapons from semiautomatic to near full automatic by attaching bump stocks. The previously little-known devices — which are legal — allow semiautomatic weapons to fire like automatic ones by replacing the stock with a sliding stock accessory that uses the gun's own recoil to increase its firing rate similar to an automatic rifle. The NRA briefly signaled support to discuss reining in bump stocks. "The NRA believes that devices designed to allow semi-automatic rifles to function like fully automatic rifles should be subject to additional regulations," the gun lobby said in a statement shortly after it was confirmed that the Vegas killer used the accessories to fire more rounds into the concert crowd on the Vegas Strip. And, for a Washington minute, it appeared that a bipartisan effort to regulate or even ban the devices was gaining momentum. "I own a lot of guns, and as a hunter and sportsman, I think that's our right as Americans, but I don't understand the use of this bump stock," Republican Sen. John Cornyn of Texas said shortly after the massacre, adding that it "seems like it's an obvious area we ought to explore and see if it's something Congress needs to act on." But, once again, nothing happened. Even the NRA revised its statement. As we've reported, the bump stock effort has gone nowhere in Congress. "It's the NRA once again pretending that they won't oppose something. And when push comes to shove, they find workarounds to make sure the issue isn't actually able to be dealt with," Robyn Thomas, executive director of the Giffords Law Center to Prevent Gun Violence, told us. It's part of a longer pattern. Underscoring the force of the gun lobby, congressional Republicans have led efforts in recent years to block gun control legislation after mass shootings — often citing the Second Amendment. After the massacre at Virginia Tech, the GOP helped stop efforts to limit the size of gun magazines. Following the killing of 20 children and six adults at Sandy Hook Elementary School in Newtown, Conn., five years ago, Republicans helped stop proposals to expand background checks of gun buyers. And in the wake of last year's massacre at Pulse nightclub in Orlando, Fla., they halted legislation that would have stopped gun sales to people on terrorism watch lists. Spurred, in part, by this legislative obstructionism, some gun control advocates are taking matters into their own hands and running for elected office. And some cities are taking their own action on bump stocks instead of waiting for Washington to act. Mental health, guns or both? The Texas mass shooting refocused attention on long-standing flaws in the Pentagon's reporting system to civilian law enforcement. Oversight groups say the armed forces routinely fail to submit the required crime data to the FBI for inclusion in national databases. A recent New York Times editorial blasted the Defense Department's pervasive reporting flaws that helped enable the murder of 26 Americans "by a wife-beating child abuser who should never have had a gun." The killer, Devin Patrick Kelley, had a history of child abuse and domestic violence. The Air Force court-martialed Kelley in 2012 on charges of assaulting his then-wife and fracturing his stepson's skull. A plea deal earned a year's confinement at a naval facility. Under federal law, his conviction disqualified him from legally possessing a firearm. But the Air Force conceded that it failed to add the shooter's name to the federal database for background checks. Neither his arrest nor the conviction was entered into the National Instant Criminal Background Check System, also known as NICS, which would have flagged him as ineligible to purchase firearms. Here's how NICS works. After the Texas attack, President Trump downplayed the role of guns and access to weapons. "This isn't a guns situation," Trump said. "This is a mental health problem at the highest level. It's a very, very sad event." Brown, with the Brady Campaign, says it was clearly a gun issue. "We know that he should never have had that gun," she says. "The issue is easy access to guns by individuals who are at-risk and individuals who have criminal histories that preclude them from having guns." In 2015, background check errors allowed Dylann Roof to purchase a handgun when he should have been barred. He killed nine worshippers in a Charleston, S.C., church. This year, President Trump continued to press his campaign theme that a violent crime wave is sweeping the U.S. He repeatedly heaped scorn on Chicago, in particular. "It's worse than some of the places that we read about in the Middle East," Trump said. His attorney general, Jeff Sessions, even created a special task force on national crime and regularly touts the Justice Department's efforts to stem what his boss called "this American carnage." But while violent crime has risen in many cities in the past two years from historic lows, new preliminary numbers analyzed by the Brennan Center for Justice at New York University's School of Law show that violent crime, murder and overall crime are all projected to fall, as we recently reported. The center's analysis, based on preliminary data from police departments and reports in the nation's 30 largest cities, appears to undercut the claim that the nation is experiencing a resurgence of violent crime. Criminologists caution that the murder rate spike during the previous two years should be seen in the context of historic lows in violent crime over the past two decades. In 2014, for example, the U.S. murder rate was the lowest it has been since at least the 1960s. New York City, even after two high-profile terror attacks, is on track to hit a historically low crime rate for 2017. The city of more than 8.5 million people, the Associated Press reports, is on track to end the year with the fewest homicides since 1963, the year the city began keeping accurate crime statistics. Still, some cities including Baltimore, Chicago and others continued to see stubbornly high incidents of violence and murder. "It's great there's a slight decrease from last year, but let's not forget that last year was the worst in 20 years," Michael Pfleger, an activist priest at Chicago's St. Sabina Church, told CNN. "Let's not use the barometer of last year. ... Hell, anything should look good next to last year."